Determine if your eating behaviors are a problem, develop strategies to change unhealthy patterns, and learn when and how to get professional help when needed with this practical, engaging guide to taking care of yourself when you are not a full-blown anorexic. While only 1 in 200 adults will struggle with full-blown anorexia nervosa, at least 1 in 20 (including 1 in 10 teen girls) will exhibit key symptoms of one or more of the officially recognized DSM eating disorders--anorexia nervosa, bulimia nervosa, and binge eating disorder. Many suffer from the effects but never address the issue because they don't fully meet the diagnostic criteria. If this is the case for you, then you may be "almost anorexic." 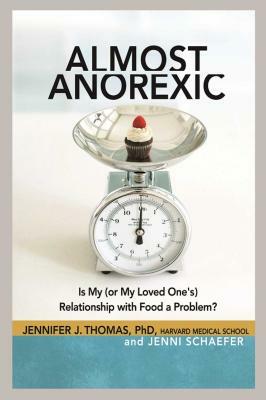 Drawing on case studies and the latest research, Almost Anorexic combines a psychologist's clinical experience with a patient's personal recovery story to help readers understand and overcome almost anorexia. Almost Anorexic will give you the skills to: understand the symptoms of almost anorexic; determine if your (or your loved one's) relationship with food is a problem; gain insight on how to intervene with a loved one; discover scientifically proven strategies to change unhealthy eating patterns; and learn when and how to get professional help when it's needed. Jennifer J. Thomas, PhD., is an Assistant Professor of Psychology, Department of Psychiatry, Harvard Medical School, and Co-Director, Eating Disorders Clinical and Research Program, Massachusetts General Hospital. Her groundbreaking scientific research, which focuses on the development of an eating disorder typology that better reflects clinical reality, has been funded by the National Institute of Mental Health, the Klarman Family Foundation, and the Hilda and Preston Davis Foundation. She has published forty scientific articles and chapters, serves on the editorial boards of International Journal of Eating Disorders and Journal of Abnormal Psychology, and is a member of the Academy for Eating Disorders and Eating Disorders Research Society. She lives in downtown Boston, where she also maintains a private psychotherapy practice, helping people with almost anorexia and other officially recognized eating disorders. Jenni Schaefer’s breakthrough bestseller, Life Without Ed: How One Woman Declared Independence from Her Eating Disorder and How You Can Too, established her as one of the leading lights in the recovery movement. With her second book, Goodbye Ed, Hello Me: Recover from Your Eating Disorder and Fall in Love with Life, she earned her place as one of the country’s foremost motivational writers and speakers. Jenni's straightforward, realistic style has made her a role model, source of inspiration, and confidant to people worldwide looking to overcome adversity and live more fully. She speaks at conferences, at major universities, and in corporate settings; has appeared on many syndicated TV and radio shows; and has been quoted in publications including The New York Times. She is also chair of the Ambassadors Council of the National Eating Disorders Association. An accomplished singer/songwriter, she lives in Austin, Texas.